Study Objective: The objective of the study was to evaluate the prevalence of interstitial ectopic pregnancy and to compare the surgical outcomes of laparoscopic cornuotomy (LC) and laparotomy (open) cornuotomy (OC) of cornual ectopic pregnancy and to analyze its associated factors. Materials and Methods: A cross-sectional study was conducted involving cases of interstitial ectopic in Hospital Putrajaya, Putrajaya, Malaysia, over a 10-year period (2005–2014). Data on sociodemographic, clinical profile, perioperative, and postoperative were obtained from the electronic medical records. Measurement and Main Results: The prevalence of cornual pregnancy was 4.0% (n = 14) out of total 347 cases of all ectopic pregnancies in Putrajaya Hospital. The mean ± standard deviation age of patient in the LC group and OC group was 29.3 ± 5.9 years and 31.4 ± 7.3 years, respectively. The duration of hospitalization and mean operating time were both significantly shorter in the LC group than in the OC group (1.43 ± 0.54 versus 2.57 ± 0.79 and 61.4 ± 15.7 min versus 97.1 ± 38.2 min, respectively, P < 0.05).There were no statistically significant differences between both groups for the estimated blood loss, requirement of blood transfusion, complications, and future fertility. Conclusion: Laparoscopic cornual resection (cornuotomy) is a safe and less invasive procedure with a comparable complication rate. It has shown that it is feasibility and should be considered as initial treatment in managing those cases in trained hand surgeons. Cornual pregnancy is a rare subtype of tubal ectopic pregnancy with an incidence of 2%–4% of all ectopic pregnancies. The condition occurs once every 2500–5000 live births. They pose a significant diagnostic and therapeutic challenge and carry a greater maternal mortality risk than other type ectopic pregnancy. The associated maternal mortality rate is 2%–3% with four deaths from ruptured cornual pregnancy was reported in the Confidential Enquiry into Maternal and Child Health report for 2000–2002. Cornual pregnancy implanted in the interstitial part of the proximal portion of Fallopian tube More Details that lies within the muscular wall of the uterus. They tend to present relatively late, at 7–12 weeks of gestation because of the myometrial distensible capacity. Rupture of the uterus may occur after 12 weeks of pregnancy, leading to hypovolemic shock and even death., In all four cases of maternal mortality, the diagnoses were made only after ruptured. Thus, the diagnosis and treatment are challenging and frequently constitute a medical emergency. A high index of suspicion is very important in managing such cases, especially in women who have a risk factor for cornual pregnancy that include past pelvic inflammatory disease, previous ectopic pregnancy, previous pelvic surgery, the use of assisted reproductive technique, and ipsilateral salpingectomy.,, Treatment modalities range from conservative medical management to more invasive surgical technique. Conventionally, treatment is through laparotomy with cornual resection or hysterectomy. As surgical techniques evolved, laparoscopy has replaced laparotomy for the surgical treatment of most ectopic pregnancies. Laparoscopic techniques include cornual resection, cornuostomy, salpingostomy, or salpingectomy. There were few publications discussing or summarizing the treatment modalities because of its low incidence, with even fewer reports on comparing surgical management of laparoscopic and laparotomy of cornual pregnancy , but no study to date specifically described the surgical short and long term outcomes of laparoscopy cornuotomy or cornual resection in Malaysia. We present our experience of surgical management of 14 cases of cornual pregnancy from Department of Obstetrics and Gynaecology, Putrajaya Hospital, the leading laparoscopic practising department in the country. Putrajaya Hospital is a tertiary hospital in the country's administrative center, Putrajaya, Malaysia. The aim of this study was to evaluate the prevalence of cornual pregnancy and to determine the feasibility and safety of laparoscopic management of cornual pregnancy. A retrospective cohort study was conducted at Putrajaya Hospital, Putrajaya, Malaysia, which is a tertiary government medical center. The study was approved by the national board, Medical Research Ethics Committee including the waiver of informed consent. Medical records through electronic medical records of all patients who underwent surgery for cornual pregnancy at the study center between January 1, 2005, and December 31, 2014, were reviewed. All women were assessed thoroughly by physical examination, transvaginal sonography, full blood count, and serum human chorionic gonadotrophin (hCG) levels. Option of surgical intervention was made by attending surgeon based on hemodynamic status of the patients, the pregnancy status, the future pregnancy desire, and also the capability of laparoscopic surgery by the surgeon. The clinical data of patients who underwent LC and OC were retrospectively analyzed which comprised of demographic information and clinical characteristics including age, race, weight/body mass index, gravidity, gestational age, risk factors of ectopic pregnancy, and perioperative and postoperative data (including recurrence rate and subsequent pregnancy outcome). Continuous data were summarized as a mean ± standard deviation and categorical data as number and percentage. Continuous data were compared through two-sample t-test, and categorical data were compared through Pearson Chi-square test. Nonnormally distributed continuous data were presented as median with interquartile range (Q1–Q3). Within-group comparisons were performed with the nonparametric Wilcoxon signed-rank test, and the Mann–Whitney U-test was used for comparisons between groups. In addition, univariate and multivariate linear regression models were applied to determine the effect of demographic and clinical characteristics on surgical outcomes. All analyses were performed using SPSS version 21.0 (IBM, Armonk, NY, USA). P < 0.05 was considered to indicate statistical significance. During the study period, there were 14 women with a confirmed cornual pregnancy and were included in the analysis. As there were a total of 347 extrauterine pregnancy in our center during the study period, the prevalence of cornual pregnancy was 4%. Those women were divided into two groups which involved seven women underwent LC and seven women underwent conventional laparotomy cornuotomy (OC). The demographic and clinical profiles of the two groups are summarized in [Table 1]. The mean age of the patients in the LC group and the OC group was 29.3 ± 5.9 years and 31.4 ± 7.3 years, respectively. Most (71%) of our patients were within 21–30 age group. The mean body weight was lower in the LC group (55.3 ± 12.1) than in the OC group (59.6 ± 14.7) but not significant. In addition, the mean period of amenorrhea at presentation in both LC and OC groups was 8.4 ± 2.1 and 11 ± 4.6 weeks of gestation, respectively. There were no significant differences in the mean age, race, gravidity, and gestational age at the time of surgery between the groups. Majority of women presented with abdominal pain and/or per vaginal bleeding. A total of six cases were in hypovolemic shock due to ruptured cornual pregnancies at presentation in which two (28.6%) women in laparoscopic group and four (57.1%) women in laparotomy group. Most of them were diagnosed ruptured cornual ectopic pregnancy intraoperatively (78.6%, n = 11). However, there was not statistically significant. Hemodynamic status parameters such as vital signs and preoperative hemoglobin level at presentation did not differ between the groups. In terms of risk factor for cornual pregnancy, only one woman was conceived through in vitro fertilization while others conceived spontaneously. Only one woman (14.3%) in the laparoscopy group and three women (42.9%) in laparotomy group have the previous history of ectopic pregnancy with salphingectomy. Four women (57.1%) in laparoscopic group have a history of pelvic surgery compared to three women (42.9%) in laparotomy group. There were no statistically significant differences between two groups in terms of having risk factors of ectopic pregnancy including the previous history of ectopic pregnancy, previous pelvic surgery, and method of conception as shown in [Table 2]. The main surgical intervention performed was resection of cornu (71.4% in LC group and 100% in OC group). One patient with post laparoscopic salpingostomy was given a single intramuscular Methotrexate injection and the β-hCG level normalised within a month. There were no significant differences between either group regarding surgical treatment. Six women presented with hypovolemic shock in which four of them (57.1%) converted to laparotomy. There were no significant differences between the groups in terms of surgical treatment. The mean operating time among women underwent laparoscopy was significantly shorter than among women underwent laparotomy (61.4 ± 15.7 min versus 97.1 ± 38.2 min, respectively, P < 0.05). 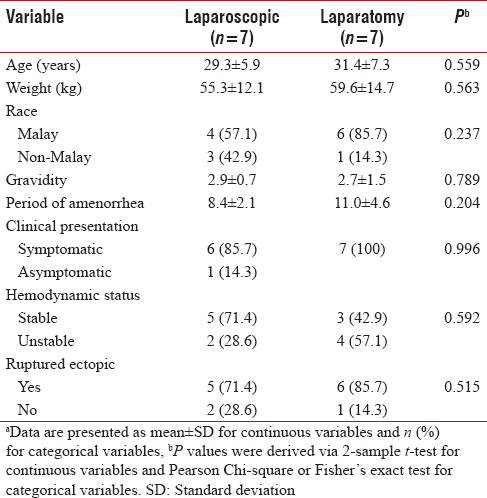 In addition, the duration of hospitalization was significantly shorter in laparoscopic group compared to laparotomy group (1.43 ± 0.54 days vs. 2.57 ± 0.79 days, P < 0.001) [Table 3]. The mean of estimated blood loss (EBL) was lower in LC group compared to OC group (771 ± 675 ml vs. 1200 ± 1066 ml, respectively) and only 2 (28.6%) patients in the laparoscopic group required blood transfusion, whereas 4 (57.1%) in laparotomy group needed blood transfusion. However, the results were found not statistically significant. There were also no major intraoperative and postoperative complications encountered. Meanwhile, five women got pregnant following the procedure and two of them ended up with early miscarriage and three of them delivered full term successfully through lower segment cesarean section (LSCS). There was no case of uterine rupture or dehiscence reported, whereas none of the women had a recurrence of ectopic pregnancy. However, there were no statistically significant differences between both groups for the estimation of blood loss, requirement of blood transfusion, complication, and recurrence rate and fertility outcome. In this study, the prevalence of cornual pregnancy was 4% which is comparable to other studies., The clinical efficacy of laparoscopic and conventional open cornual resection was comparable. Many studies have reported that the advantage of laparoscopic approach of removal of cornual ectopic pregnancy includes shorter operating time and duration of hospital stays.,, The present data showed that laparoscopic cornual resection was associated with less operating time and hospital stay length compared with open cornual resection. The sociodemographic characteristic and the incidence of complications were similar in both groups. There are two main surgical approaches for extrauterine pregnancy which are either laparoscopically or open laparotomy. Laparoscopy is a gold standard diagnostic and therapeutic tool of managing patient with extrauterine pregnancy. Even there is significant hemoperitoneum, laparoscopic surgery can be safely performed by an experienced laparoscopic surgeon with adequate perioperative support. Soriano et al. have advocated laparoscopic surgical treatments to better preserve the uterine integrity for future fertility. In addition, the surgical morbidity is lower and recovery time for the patient is faster. Cornual pregnancies tend to present relatively late, at 7–12 week of gestation because of the myometrial distensibility capacity., The gestational age at diagnosis in OC group is higher compare to LC group, probably explain the more hemodynamically unstable patients in OC due to ruptured ectopic pregnancy. However, ruptured ectopic can still occur early as in our experiences, the earliest case presented at 5 weeks of amenorrhea with ruptured cornual pregnancy, similar finding as reported by Ng et al. Tulandi et al. reported that cornuostomy is appropriate for gestations <3.5 cm, whereas Grobman and Miladrecommended cornual wedge resection for gestation >4 cm. However, in our study, there was a tendency to perform cornual wedge resection instead of cornuostomy regardless the size of gestation in both groups because of the belief that wedge resection would result in fewer persistent cornual pregnancies. In the current study, the mean numbers of operative time were significantly reduced in the laparoscopy group than in the laparotomy group (P< 0.05) with 35 min longer in laparotomy group and it was comparable with a study done by Soriano et al. This is probably as a result of the longer amount of time is required to suture the large abdominal incisional wound compared with the time required to suture small few incision in LC group. Meanwhile, the result of a shorter operating time in laparoscopic surgery partly maybe because of the better direct visualization of the lesion, blood vessel tamponade created by pneumoperitoneum and faster hemorrhage control. The total length of hospitalization was significantly affected by the type of surgery. The mean number of postoperative hospital stay was shorter in the laparoscopy group than in the laparotomy group (P< 0.001). This finding was comparable to a study done by Hwang et al. (2011) They found that there was no significant difference between two groups for mean operation time, EBL, requirement blood transfusion, and complications, but the laparoscopy group had significantly shorter duration of postoperative stay (P< 0.001) from the laparotomy group. It is a well-established advantage of the laparoscopy procedure over laparotomy in which closely related to pain management and wound care. We have also shown that, in our review, most of the unstable cases were managed by laparoscopic surgery without any difficulty and complications. Even if there were existing previous pelvic surgery and pelvic disease which has resulted in pelvic adhesion, the surgical outcome was still the same as laparotomy. In all cases, there were no reports of adjacent structures' injury intra-abdominally. In this study, the amount of EBL intraoperatively was lower in laparoscopy group than in laparotomy group; however, it was not statistically significant. This is probably due to the presence of hemoperitoneum in ruptured cornual pregnancies which were included in total EBL. In our laparoscopic group, the greatest estimated hemoperitoneum was 2000 mL, and the procedure was carried through successfully. The hemostatic secure by the usage of hemostatic agents and good suturing methods are very important measures to help prevent hemorrhage. It allows a safe removal of the ectopic pregnancy and repair of the uterine defect created. 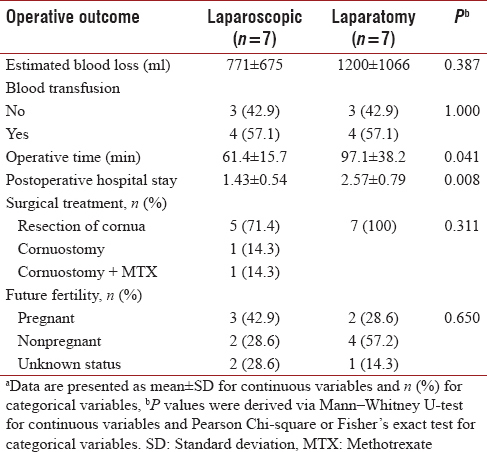 These results signify that the laparoscopic surgery is safe and feasible even in ruptured cornual pregnancy with massive hemoperitoneum and hemodynamically unstable patients provided hemodynamic stability is accomplished by perioperative management. The predisposing factors for cornual pregnancy are similar to those for ectopic pregnancy in general. Those factors that commonly associated with the cornual pregnancy were included contralateral or ipsilateral salpingectomy, previous ectopic pregnancy, pelvic inflammatory disease, uterine anomalies, and the usage of assisted reproductive technology., Some of the predisposing factors have been demonstrated in this study. The two main concerns of laparoscopic treatment of cornual pregnancy are recurrence and uterine rupture in the future pregnancy. Uterine rupture has been postulated due to a defective area of uterine wall and tissues' damage by electrosurgery during the cornual resection., Elective LSCS after laparoscopic cornual resection is strongly recommended by most studies to reduce the risk of uterine rupture in labor., In our study, three women were monitored closely and delivered through elective cesarean section at 37–38-week period of amenorrhea. There was no case of uterine ruptured or dehiscence reported. In addition, there was no recurrence of extrauterine pregnancy documented. We have demonstrated that cornual pregnancy can be managed successfully by laparoscopic, and it offers several advantages over conventional treatment through laparotomy. It is not only result significantly reduced hospital stay with associated financial savings but also reduced patient morbidity, speedy postoperative recovery, cosmetically good scar, and enabling women to return to their normal activities much sooner. Thus, we believe that the decision on the operative route should not be based on the hemodynamic stability and the amount of blood in the abdomen. With this in mind, it is important to emphasize that the fastest and safest approach is always the one that the surgeon feels more comfortable with, and this should always be a factor in the decision regarding the type of intervention. The major limitations of the study were its retrospective study design and limited to a single center as well as relative small sample size. Laparoscopic surgery has developed tremendously over the past decade; better sealing devices, development of barbed sutures, and the presence of three-dimensional laparoscopic system have shorten learning curves and adaptability of the surgeon to laparoscopic intervention. This has been shown by more and more complex surgeries that can be performed laparoscopically. Cornual pregnancy requires a rapid and swift resection and plugging of the source of bleeding. This has been shown achievable in this study. We call for all surgeons to shift to this new platform. As surgical techniques evolved, surgeon must evolve to techniques that would give better outcome and ultimately benefits the patients. Rock JA, Jones HW, editors. Te Linde's Operative Gynecology. 10th ed. Philadelphia: Lippincott-Raven; 2008. p. 816-7. Confidential Enquiry into Maternal and Child Health; 'Why Mothers Die' 2000-2002. The Sixth Report of the Confidential Enquiries into Maternal Deaths in the United Kingdom. London: RCOG Press; 2004. Ng S, Hamontri S, Chua I, Chern B, Siow A. Laparoscopic management of 53 cases of cornual ectopic pregnancy. Fertil Steril 2009;92:448-52. Radwan F, Martin S. Management of cornual (interstitial) pregnancy. Obstet Gynaecol 2007;9:249-55. Soriano D, Vicus D, Mashiach R, Schiff E, Seidman D, Goldenberg M, et al. Laparoscopic treatment of cornual pregnancy: A series of 20 consecutive cases. Fertil Steril 2008;90:839-43. Tulandi T, Al-Jaroudi D. Interstitial pregnancy: Results generated from the society of reproductive surgeons registry. Obstet Gynecol 2004;103:47-50. Hwang JH, Lee JK, Lee NW, Lee KW. Open cornual resection versus laparoscopic cornual resection in patients with interstitial ectopic pregnancies. Eur J Obstet Gynecol Reprod Biol 2011;156:78-82. Pal B, Akinfenwa O, Harrington K. Hysteroscopic management of cornual ectopic pregnancy. BJOG 2003;110:879-80. Lau S, Tulandi T. Conservative medical and surgical management of interstitial ectopic pregnancy. Fertil Steril 2000;73:1063-4. Tulandi T, Vilos G, Gomel V. Laparoscopic treatment of interstitial pregnancy. Obstet Gynecol 1995;85:465-7. Grobman WA, Milad MP. Conservative laparoscopic management of a large cornual ectopic pregnancy. Hum Reprod 1998;13:2002-4. Timor-Tritsch IE, Monteagudo A, Matera C, Veit CR. Sonographic evolution of cornual pregnancies treated without surgery. Obstet Gynecol 1992;79:1044-9. Pelosi MA 3rd, Pelosi MA. Spontaneous uterine rupture at thirty-three weeks subsequent to previous superficial laparoscopic myomectomy. Am J Obstet Gynecol 1997;177:1547-9. Manea C, Pavlidou E, Urias AA, Bouquet de la Jolinière J, Dubuisson JB, Feki A, et al. 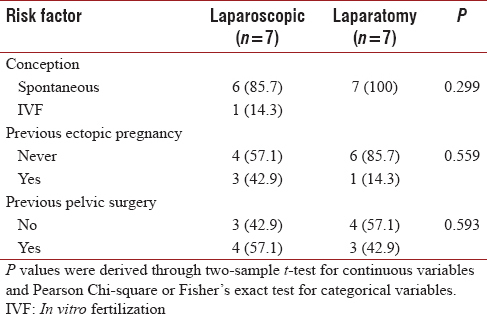 Laparoscopic management of interstitial pregnancy and fertility outcomes after ipsilateral salpingectomy – Three case reports. Front Surg 2014;1:34.